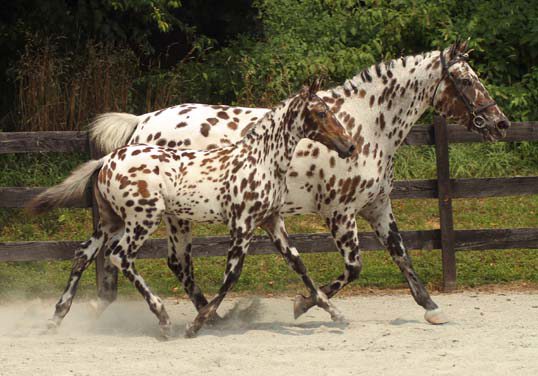 Stonewall Scarlett was the third of three striking leopard fillies foaled by Stonewall Sporthorse Superior Producer Stonewall Crystal, a daughter of 1967 National Champion Crystal Curtain. Scarlett is a correct and lovely moving mare with a tractable disposition. She settled easily into her early training to ride and drive, joining her older sisters Stonewall Blanche and Stonewall Stella to lead the epic 2001 Horsedrawn Journey Across America. She performed with distinction across the North American continent, demonstrating her soundness and courage on this demanding three thousand miles trek. Following the Journey Across America, Michael Muir took a hiatus from breeding to serve as President of United States Driving for the Disabled. Scarlett was transferred to Bec Stud in Virginia, with a provision that a future foal would return to Stonewall Stud to carry on this illustrious line. Scarlett proved to be an excellent broodmare, founding a lasting dynasty of champion horses across North America, but she is also recognized with a Certificate of Achievement in Long Distance Driving for her stellar performance on the Horsedrawn Journey Across America. Stonewall Stud reacquired Scarlett in 2010. After her son Destrier de Bec was weaned, Scarlett was returned to work for Access Adventure, earning Certificates of Achievement in Equine Facilitated Therapy as a therapeutic riding horse and in harness. The qualities Scarlett has amply demonstrated in performance have carried down through her prolific bloodline to create a lasting influence of champions in the Stonewall Studbook today.